Mr. Heller was 15 when he was sent to Auschwitz in 1944, and escaped during the death march in 1945. He will share about his amazing life from his childhood in Teplice Samov near Prague, Czechoslovakia, to Teresienstadt, to Auschwitz, to Prague and then to the United States. He says his story is one of luck. To those who know his story, it is one of courage and determination. Mr. Heller owned the popular, well-known Heller’s Baby News in San Rafael for 52 years. He is a continual inspiration to all who hear him speak and to his devoted friends and family for his love of life, kindness and generosity. Judith Borowsky, who helped arrange this talk, writes: "I first learned of Mr. Heller when I met his daughter Vivian Cohen at classes at the Chabad Center. Vivian is the Administrative Chief of the Marin Medical Reserve Corps. After class one day she mentioned her father and his incredible life. When I saw her face light up just talking about him, I knew he must have a very special story. I called him the following morning and he couldn’t have been more kind and open to speaking to us. Come and enjoy meeting Mr. Heller and one another. Your presence will add light and strength to our Jewish community." Tea, coffee, and light refreshments. $10 admission, open to the public. Space is limited. RSVP appreciated by Thursday, February 18th. Feel free to share this link with friends. 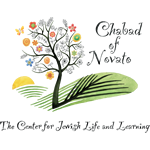 If you need assistance with climbing the stairs to the Chabad Center, please contact Rabbi Landa at Rabbi@JewishNovato.com.